In the past week I returned to meeting the sun as it rose, writing along with the morning rays. The serenity hours lent themselves to reflection and personal evolution. Two decades of school and life in general awakened a fear within that my mind, will, and thoughts were not entirely my own. For a brief moment I was genuinely afraid. In the middle of the expressway during an early morning drive I said to myself, “Who’s talking? Me or them?” That strong sense of self that took years to build had grown eerily quiet. In the midst of grief for a physically departed inspirational figure I started to reevaluate and urged myself to get back to me. A great deal of what we are is conditioned and it becomes hard to recognize our true self, our own voice, and even our own soul. We become strangers to ourselves in the hustle and bustle called life, and quickly forget that this life isn’t living. The noise outside and “what the next guy is doing” robbed many of their internal focus and ability to hear and listen to yoursoul. That’s not a typo, Google. The term “yourself” dictates vessel, but “yoursoul” allows your mind to recognize the spiritual self operating said vessel. We’re so busy trying to make the self attractive, branded as high-end, that we forget about the essential being within. If that’s out of balance or ignored, you’ll never be what you were meant to. That’s the truth. 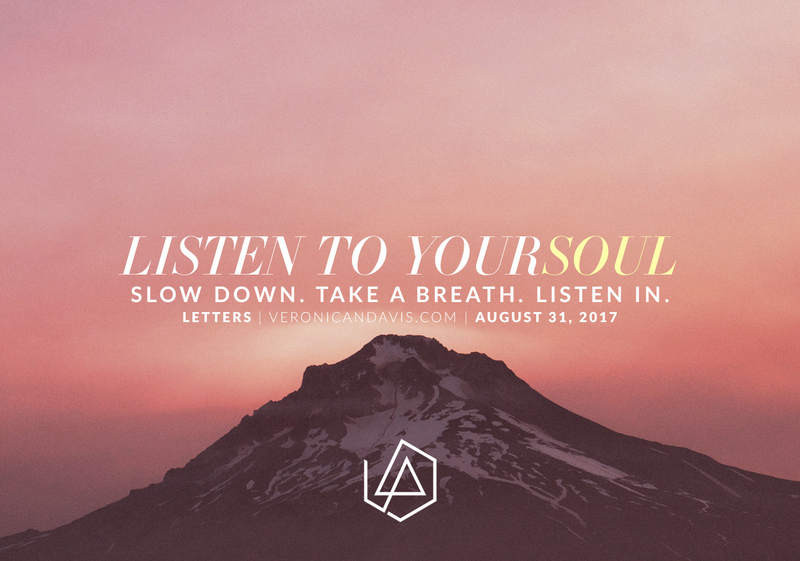 You have to listen to your soul. When I wasn’t listening to my soul I was angry. It would be 3AM and I had yet to fall asleep because it was restless. My anguish wasn’t entirely my own. It was the energy surrounding me. Still, enough of it was mine to get me to sit up and meditate. I had been neglecting myself in favor of helping people around me be less miserable. I stopped designing, writing, playing the piano, working out, meditating, and everyone else became priority. It made me tired and disappointed. I was more exhausted of the world than I was prepared to admit. It isn’t that my life is the epitome of a drama sitcom – it’s actually quite far from it. If we are completely honest, I’ve been damn good about placing positive vibes into the universe as it relates to my life and my journey, but the world itself devastates me. Our journey is a series of teachable moments, woes, and heartaches. That is the human experience. That is why listening to your soul is so imperative. It’s your guiding compass in a land that is indefinitely torn, scared, and damaged. Another reality you have to accept. You can try as you might, but…when it’s all said and done you can only control you. You can exude positivity, smile when you see someone crying, talk to a stranger who clearly needs it, but keep in mind that the only person you can save, the only person you can help in the big moments…is yoursoul. This isn’t to say you won’t inspire change. This is simply to say if you lose someone, you have to accept that their story’s ending was not your fault. If you lose your soul, you have to accept that you have to put in a lot of work to reclaim it. Don’t judge someone for being tired of this world. Our stories, journeys, lives…are different and unique to them often in hidden ways. You don’t know anyone 100%. You barely know yourself that well. Just promise me that when things get crazy you will take the time to slow down, take a breath, and listen in. Your soul has more answers than anyone around you because your true self knows what you need. If you’re too busy drowning it in gossip, fake news, and celebrity chaos then you can’t hear it. Our souls need our undivided attention. That’s a tool from our schooling years you can try. Don’t get lost in a world that doesn’t know what compassion, love, and generosity are. Don’t let this illusion cause you to miss out on your purpose.